In our continuing exploration of Netflix's original science fiction and fantasy content after movies like Annihilation, we came across Extinction as one of my primary recommendations one weekend and so the journey continued. And this was yet another experience of jumping into a movie without any knowledge of what it was fully about or what the reviews were like. Fun times. The movie certainly felt a lot like Cloverfield in the beginning given how the initial contemporary normalcy was eventually shoved away by a cataclysmic event. But of course the full story of that movie had a bit of a twist at the end, which is something that Extinction shares in terms of the general narrative structure. Of course the actual plot is significantly different when you get down to the details and has a semi-mystical element given the dreams that plague our protagonist and seem to warn of a danger yet to come. But of course the promotional material including the posters for the movie clearly indicate the future technology angle that also plays a part in the story. 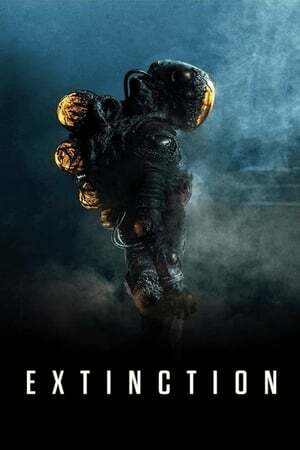 Synopsis: Extinction is a 2018 American science fiction thriller movie directed by Ben Young for Netflix. The screenplay was written by Spenser Cohen, Eric Heisserer, and Brad Kane. Peter (Michael Peña) is an engineer who has been troubled as of late by disturbing nightmares about some sort of an extraterrestrial invasion that threatens his family and the rest of the city. The stress he goes through because of the dreams spills over to his interactions with his wife Alice (Lizzy Caplan) and their children. And so she urges him to see a professional and determine the cause of the nightmares. But as is the way of these things, in the end his fears prove true and what starts as a small celebration with friends at their apartment quickly turns sour when spaceships appear that begin to attack the city. That leaves Peter, Alice and some of their friends to try and get the kids to safety. If only they could understand what the dreams meant and how it connected to the current events. But they still have the more immediate problem to deal with, that being where to find safety with the entire city being overrun by armored warriors. What I Liked: The movie was certainly smart or at least had a very clever concept driving it, which gives it a bit of an old school sci-fi feel to its story. You have a big mystery with a fairly strong character focus and a larger conflict beyond. The movie does well to keep the story very personal instead of giving in to temptation and following the story to the level of the greater invasion of how it impacts their community as a whole. I also rather liked the look and feel of the invaders - something that was both technologically different but also highly organic. It felt futuristic and disturbing at the same time, which added to the general tone of the movie. The technology all made sense in the long run once you get to the end of the movie and that's just as well. What Could Have Been Better: The initial bit about the dreams felt like it had gone on a bit too long before the legitimate action began in earnest. I know it helped foreshadow later events and added a nice sense of confusion and mystery to the story but maybe we didn't need to dwell on it for so long. But at the same time the segment of the movie that was focused on them trying to keep pace with their attackers also felt like a lot of narrative nothing as it was just thrill sequence after thrill sequence after thrill sequence. The greater focus on the character of Peter left most of the other characters in the lurch in terms of greater development. Not that Peter was all that explored as a character either. His dreams were more of a character than his family, especially given how much focus had been directed towards reminding us as an audience that they were still important. The big reveal at the end was quaint but not all that surprising, especially given how the story had progressed. TL;DR: Extinction was certainly an interesting attempt at telling a science fiction story with a strong pseudo psychological twist to things but the actual execution was slow and dragging. The end result was something that felt quite lacking with a climax that didn't really add more to things. Thus the movie gets a passable 1.5 alien invaders out of a possible 5.